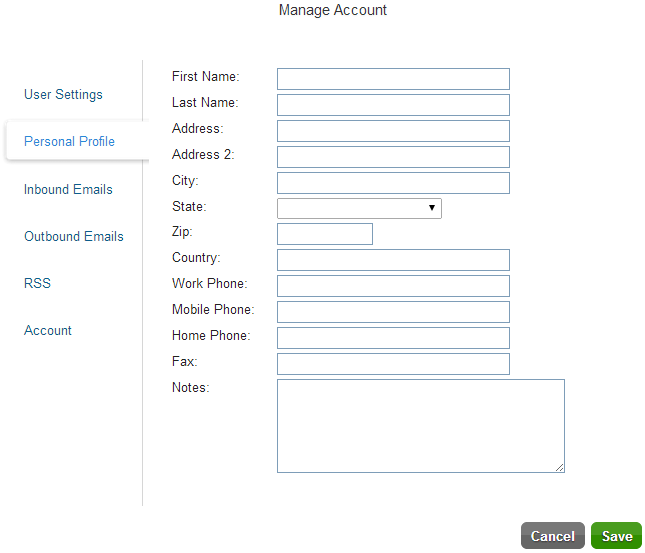 Click your name in the top left corner to customize your general settings, personal profile, email settings, and billing information. Any settings changes you make will apply to your whole account; that is, across all of your Workspaces. Below is the page you will be brought to after clicking on your name. 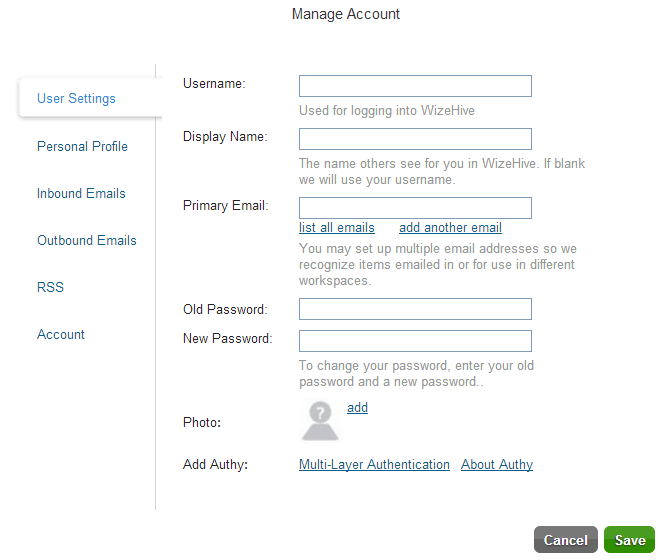 Username: Your username is the name that you chose when you signed up for WizeHive and which is used to sign in. Display Name: The display name is how you are identified to other users in WizeHive within and across workspaces. If left blank, the system will utilize your username by default. Your display name will appear in the upper right hand corner of the navigation bar when you are in WizeHive. You can click on your display name in order to be able to see the dropdown that enables you to logout of WizeHive. Primary Email: Your Primary Email is the email you wish to use to receive WizeHive related communications. It will represent your primary mode of contact. New/Old password: You can enter your current password so that you can change/update the password that you use. Photo: Add your photo so that your users know what you look like. Create a more friendly Workspace! 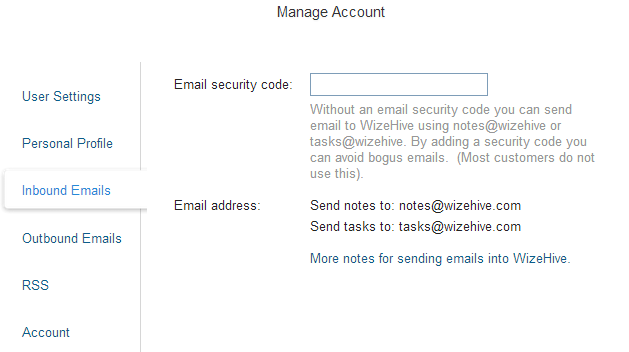 Without an email security code you can send email to WizeHive using notes@wizehive.com or tasks@wizehive.com. By adding a security code you can avoid bogus emails. You can submit notes via email to any of your Workspaces. For example, if you have an update regarding the Workspace or an entry in the Workspace that you want to notify others in the Workspace of but you are not currently able to log in to the Workspace, you can send a note to the Workspace via email. That note will appear in the activity stream of the Workspace. By having a security code set, you can avoid emails coming in to the Workspace from bogus email addresses. If you are not using an email security code (specified in your Profile settings and described below), address the email to: notes@wizehive.com. Then, in the subject line put the name of the Workspace followed by a colon (:) followed by the name of a record in brackets ([ ]). For instance, if you are adding a Note to a Workspace called ABC and a record called Marketing, you would include this in your subject line [ABC:Marketing]. You may also include other information in your subject line; just put it in outside of the brackets. Finally, type the rest of your text in the body of the email. Body: Frank Thomas will be hosting a 2nd wine tasting event at 9pm at the Grayville Dock. Email me when a new record is created. Your main RSS link will give you a feed of all activities in your Workspace. Authenticated RSS feeds will not work in some popular RSS readers, so we give you the option of creating a public RSS feed. By clicking on the 'Make public' link WizeHive will generate a very hard to guess, unique URL for your main RSS feed. If you use this URL, you will not be asked for a username or password. Your various RSS feeds are listed in the box. Every user has access to their own authenticated RSS feeds by default. Since it is authenticated, you will be asked for your username and password.